My first encounter with wine was really early in life. At a young age my father used to let me taste pretty much everything in very small quantities and my best friend’s father was really passionate about wine so I was surrounded by it during my upbringing. However, I only really developed an attraction for the wine industry about eight years ago when, during my time managing a restaurant, Glenn Caldwell, a wine representative I was dealing with, shared his particularly infectious passion for wine with me. This was the starting point for me. 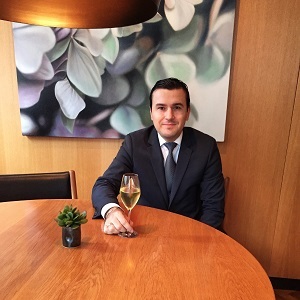 To be a good Sommelier encompasses several layers of knowledge, experience and passion and those skills need to combine both front and back of house. Customer service is paramount. You must be devoted to make the guest’s experience the best it can be while being approachable and in touch with your clientele. Staying composed when someone orders an exclusive bottle of wine is also an important skill. Working in high end restaurants, one must be eloquent, articulate and have the ability to read tables and adapt to various situations. On the other hand, a very important aspect of the role and one the guests don’t see is the less glamorous and quite physical part of the role – stocking fridges and moving boxes, storing wine at the best possible temperature as well as maintaining the list which takes a lot of time and devotion to keep it current and relevant. Time is also needs to attend wine tastings and to constantly research. To sum up, time management skills, people skills, communication skills, and good wine knowledge are necessary to be a good Sommelier. I would suggest the individual to firstly ascertain what type of restaurant and service style they most relate to. Are they a Relais et Chateaux kind of person or more a high end brasserie type? It is important to know what you enjoy and go for it. Being in the right environment will help you develop your personality and skills. I would also say to keep studying and never assume that you know enough. The wine world evolves constantly and keeping up with the trends as well as the industry changes is important. First: know what food they ordered. Second: discuss personal preferences with guest or type of wine they feel like. Third: Suggest 2-3 price points but never above $150 unless the guest points you toward this direction. Essentially one needs a strategy when selling wine. Whilst the process is conversational, it is important to appear professional and be very knowledgeable about the wine list. I am a firm believer that an elegant, light, pretty glass is important in a dining experience. On the other hand, it must be a strong enough glass to last in a busy environment. Just like in a car, the closing sound of a door is important. A warm and deep sound is perceived as luxurious but a metallic sound achieves the opposite. I personally like to serve pinot noir and chardonnay in a burgundy glass, shiraz and cabernet in a Bordeaux glass and all dry white wines in a riesling glass. One must add spectacle to a restaurant environment. Elegance, comfort, and beauty are important intangibles which benefit a guest’s fine dining experience. Essentially, there are two schools of thoughts. One contrasts the wine with the food. For instance, rich cheese with dry white wine or champagne. On the other hand, one can complete the food with a wine of similar characteristics. For example, creamy pasta with rich creamy Chardonnay. It is essential to discuss this with guests in order to understand the extent of their knowledge but also the extent of their dining experience to gently guide them in best direction for their experience. A casual dinner may not appreciate the same approach as a regular high end dinner and it is important to tailor make each guest experience. Communication is therefore the very first key to a great wine match. I personally enjoy balance and contrasting food / wine match. I do believe that all bottles should be tasted by the Sommelier before the wine is served to the guest. People pay a lot of money for a delicious bottle of wine and it is important this is checked to ensure the correct quality is being served. If the wine is faulty, we open another bottle but no guest should taste a faulty wine. In my opinion this would be the worst thing that could happen to a sommelier during service. It is important to relate to a wine list within the context of how it relates to the menu. Wine is to a restaurant what a stem is to a glass. It is supporting the food. My main approach when constructing a wine list is to be deeply familiar with the menu and decide what would be appropriate to serve with these dishes. Regarding pricing, I understand that some establishments do heavily mark up their wines however we avoid this at all costs and keep the markup on our list fair and reasonable and in line with a formula based on the cost price. Mark up is a decision that each establishment has to make individually. I am fortunate enough to have great relationships with my suppliers and they invite me to many tasting and masterclasses. Without them, it would be very challenging to stay up to date. Again, discussing with my suppliers trends of the industry is always fascinating as they know first hand what the changes are. It is also important to get to know few winemakers in your area so you can visit them at their vineyards from time to time and get their opinion on various subjects. I feel it is important to bridge the producers with their customers. In my particular case, I must make sure the wine is of quality and in line with the philosophy and menu of Chef/Owner of The Bridge Room, Ross Lusted. Ross works really hard to make sure we get the best ingredients available in the market on a daily basis and I must ensure the wine I serve is of the best quality and at great value to maximize each and every guest experience. Quality, availability, distribution, price, region and grape varietal. I look at all these things before I even think of listing the wine. I will also look at creating a relationship with the winemaker and wine team just so it isn’t just a sell but an opportunity for both to learn more about each other. I think I would be a Pinot Noir. I love the grape for being fragile yet so powerful, delicate yet complex. It is a versatile grape that really absorbs the terroir in which it is planted. Champagne: I always have a bottle of Champagne in the fridge; who knows when the next excuse to celebrate is coming! Riesling: preferably German of Kabinett level. My wife loves it and I think it’s delicious and interesting. Pinot Noir: Finally I would have a Burgundy red because you can have it on its own at anytime. To be honest, there are so many excellent food/wine magazines in Australia it’s difficult to single just one out. But for Champagne I do particularly recommend the Champagne Guide by Tyson Stelzer.